A puzzle cutter is a unique tool that can transform images into puzzle pieces. Almost any photo will work, from a family snapshot to something printed from a computer. Cutters range a great deal in function and price, so choose the one that is best suited to your needs. If the goal is to create small puzzles from photographs to use or distribute to friends and family members on a limited basis, an inexpensive craft puzzle maker will suffice. Most craft or department stores sell these. The units consist of a set of metal dies and a tool to press the die into the puzzle material. This inexpensive option, Make Your Own Puzzles, is sold by Marbles the Brain Store. The sturdy plastic tool with its handful of puzzle-shaped dies costs around $25. To create a puzzle, attach foam material to the back of your image and feed the photograph through the machine to punch out puzzle pieces one at a time. The kit comes with enough foam backing for 10 puzzles. This unit sells for less than $20 and can be used to create puzzles from 4x6 or 5x7 images. 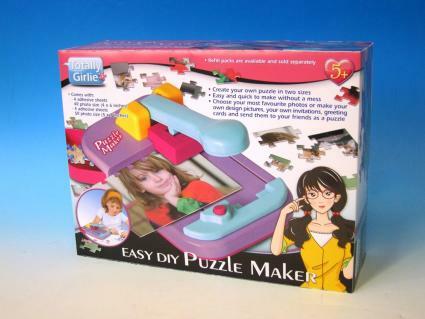 Like the Make Your Own Puzzles machine, Puzzle Maker also uses a foam backing to make the images more durable. It comes with eight sheets in the kit and refill packs are available. Etching and cutting machines like the Cricut can be used to create a puzzle out of card stock. Cricut's CTMH Artiste cartridge can be used to make custom jigsaw puzzles. The machines themselves range from $200 to $300 depending on the model while cartridges are sold separately and cost about $100 each. 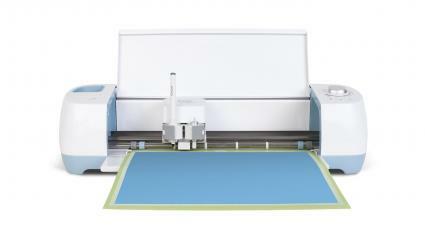 The cutting machines and cartridges can be purchased online or in craft and department stores. Creating larger puzzles, or multiple copies of the same puzzle, requires a much larger machine. These machines use hydraulics to punch out the shapes. They are downsized versions of the presses used for mass production of commercial puzzles and work by placing material inside the cutting area and activating the press. The press applies pressure, forcing the dies into the puzzle material. Unlike a craft tool, these machines can handle thicker, more durable puzzle material, resulting in professional-looking products. Since they are serious puzzle makers, they cost quite a bit more than a hobby machine would. The Hope Jigsaw Machine Model HR-1140 can be purchased from the Nebraska-based company Brooke International, with prices starting at around $5,000. Geared to an entrepreneur market, this machine creates professional puzzles. It can produce 300-piece puzzles as large as 12 by 18 inches. However, die sets are sold separately. When purchasing a machine double check which (if any) dies are included. Although the manufacturer is a foreign company (based in Canada), they do have a stateside vendor located in Milwaukee. Since the machine is for the home-business niche, the Milwaukee firm offers leasing. They also have information on how to build a puzzle-creating business including high-level instructions for the equipment and an online video that explains the process. The machine weighs more than 400 pounds and can create a 16"x40", 1008-piece puzzle. 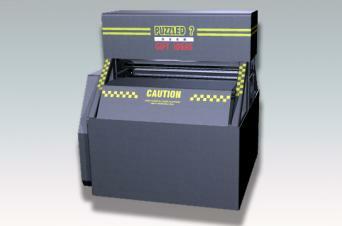 It has two rotating rollers to provide pressure for cutting cardboard, plastic and plywood up to 1/8" thick. Contact the company directly for pricing. The amount of space you have - For small spaces like a home craft room, a simple puzzle maker or scrapbooking tool is the best option. Larger equipment will work well for a home workshop or garage. The amount of money you want to spend - Jigsaw makers range from about $20 to thousands of dollars in price, so your budget will be a big consideration. Whether you want to make puzzles as an in-home business - If you're serious about making puzzles and want to sell them on a large scale, investing in a high quality, professional machine is the way to go. If you plan to make jigsaw puzzles for income, you will likely want to invest in a cutter that allows you to create a wide variety of puzzle sizes. It should also be able to stand up to more frequent use than if you buy a cutter strictly for hobby purposes. Some of the available cutters are small enough for home use, but others are quite large and are appropriate for heavy industrial use only. Whether you're preserving family memories with a fun puzzle to share with loved ones or you want to create a jigsaw puzzle empire, there are options for all puzzle makers to choose from. If you just want to make a single puzzle without the machinery, however, try a printable puzzle that you can print, cut out, and enjoy right away.